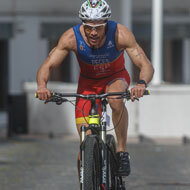 This year’s Quadrathlon World Cup series started in March on the island of Terceira. 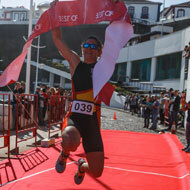 This season’s opening event took place last Saturday in the charming Azores. 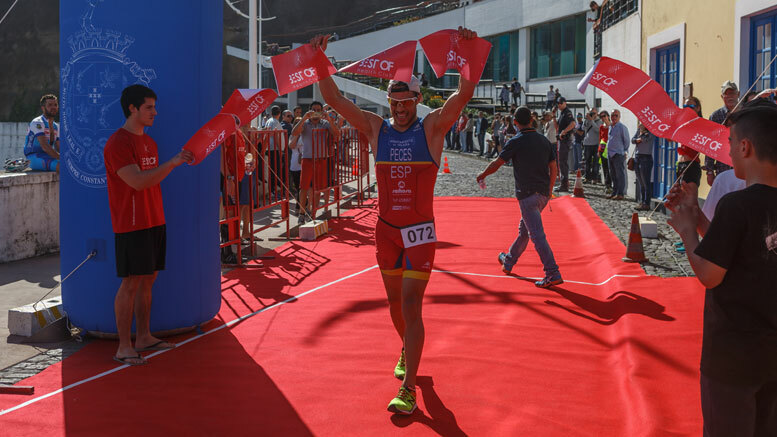 This competition, in the middle of the Atlantic, on a little-known island, offered the athletes a magical insight into the colourful world of the Azores. One of the starters described his impression as “You do not know where you are, it is like a mixture of the Caribbean and Ireland”. 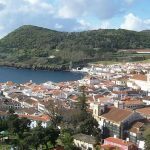 After its premiere last year, the competition this year moved from Praia da Vitoria to Angra do Heroismo with its historic old town, which is a UNESCO World Cultural Heritage site. There was also a change from a road bike course to MTB. Both changes were worth it! The weather gods were on our side: blue sky, sun, little wind and few waves – ideal conditions. 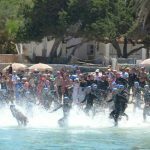 The swim was 750m, in two laps with a short beach run in between, so that the spectators could see how the race was developing. Immediately afterwards we set off for three circuits of the kayak course (a total of 4km). The flat Atlantic water was suitable for everyone to cope with. 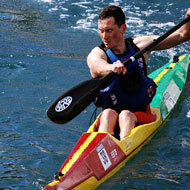 This was particularly welcome as numerous different boat types had been provided by the local kayak club. From the beach to the bike transition we had some steps to climb before the MTB section (bikes could be hired locally). Then followed 15 beautiful but also very hard kilometers over two laps. From the beach, we went up to a fortress which is over 300 years old. This is still used today by the Portuguese military and much of the route on the slopes of Mt. Brasil is normally closed to the public. 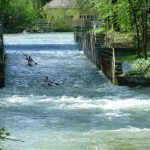 Only for the competition was the historic gate opened, which the participants had to go through after passing over a bridge across a moat – spectacular! But also relentlessly exhausting, as there were some steep ramps to cope with. The route was technically easy without big obstacles. The finale was a 5km run on the promenade over 5 laps. This was absolutely flat, which was welcome after the bike course, and allowed the many spectators to encourage the athletes to keep running hard right to the finish. 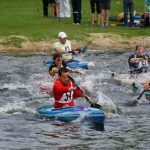 At the front of the race there were clear victories for the World Cup winners of the last two years, Enrique Peces (ESP) and Lisa Teichert (GER), each making their ambitions for this year clear. In the women’s race, Lisa Teichert led from start-to-finish giving her victory by a clear distance. 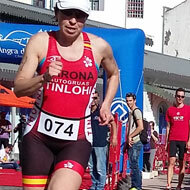 Second place was taken by Ruth Diaz from Spain, who came in front of the ever-young Jean Ashley (GBR). 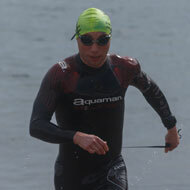 Among the men, Peces kept in touch with the top two in the swim, Laurent Martinou (FRA) and Stefan Teichert (GER). It was not long before he took the lead in the kayak and held on to this on the bike. In the run, the Spaniard stayed well clear. Martinou, who lost a lot of time in the kayak, did well on the MTB and was also quick on the road and managed to overtake Teichert. 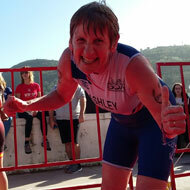 Age groups were also strongly represented, among others, the 66-year-old Mary White from England put in an impressive performance. After the medal presentations, the efforts of the participants were rewarded with a sumptuous finisher’s buffet. From hearty savories to deserts there were lots of local treats to try. The conclusion of many participants was that the competition alone, with its great scenery around Mt. Brasil and the historic old town is worth the trip. Many also used opportunity to take time to train the week before and/or after the race, where the two Teicherts organized a training camp and showed the athletes Terceira at his best. The organizer, Pedro Barthlemou, was very satisfied with the event, he would have liked to start himself. If he had, then he would certainly have been in contention for victory. He hopes that he will be able to travel to the World Cup at least once later in the year. Until the next World Cup event in mid-May, there is still some time left to continue training. 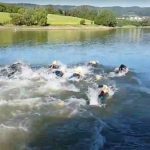 But then it gets really serious, because in Orf in Hungary the World Championship takes place again over the middle distance. Be the first to comment on "Magic start in the Atlantic"